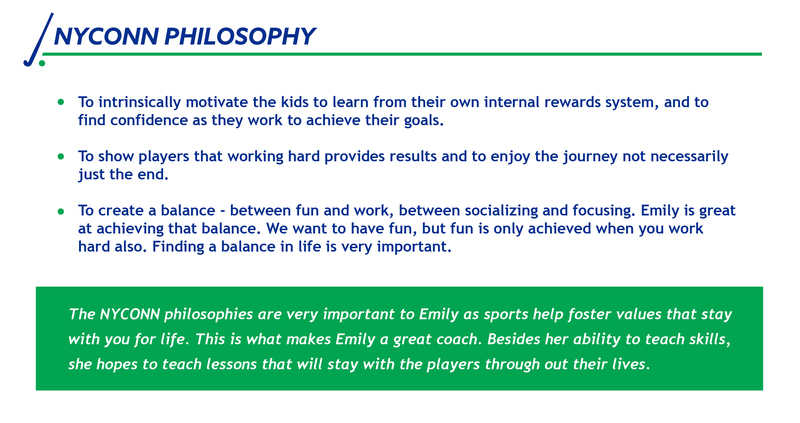 Emily is a powerful role model for young student athletes who strongly believe in the commitment to athletics and the values that athletic participation fosters. She has coached for numerous organizations - GA, Rye High School, US Field Hockey Site Director, 4Goals Collegiate Camp, FC United - and is currently the head Varsity coach at the King School in Stamford, CT. She runs preseasons at Westport Staples HS, New Canaan HS, Ridgefield HS, Joel Barlow HS, and Wilton Youth. She is also the director of GYFHA. Emily is a lifelong member of USAFH and, over the 20 years, has developed a deep network of mentors and peers that has served as a conduit for countless athletes to be recruited. She will add immense value to your child's field hockey abilities as well as overall outlook on their own life. ** Refunds will not be offered unless injured or some other circumstance pursuant to Emily's discretion.